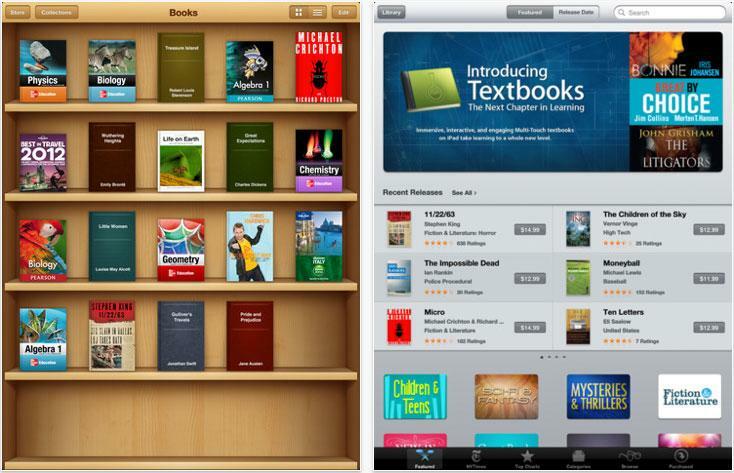 Suggesting that physical textbooks are no longer the ideal learning tool, Apple on Thursday proposed a new platform and method of digital education: iBooks 2 for iPad. Speaking to the press at New York's Guggenheim Museum, Apple's senior vice president of Worldwide Product Marketing, Phil Schiller, said current textbooks are not very portable, they're not durable, and they're not interactive. He believes the iPad stacks up better, particularly with the new iBooks 2. "Education is deep in Apples DNA and iPad may be our most exciting education product yet. With 1.5 million iPads already in use in education institutions, including over 1,000 one-to-one deployments, iPad is rapidly being adopted by schools across the US and around the world," Schiller said. "Now with iBooks 2 for iPad, students have a more dynamic, engaging and truly interactive way to read and learn, using the device they already love." Demonstrating iBooks 2 on Thursday, Apple's Roger Rosner showed off how iBooks 2 allows texbooks to start off with intro movies. He also quickly went across thumbnails for pages, and could skip across chapters. Touting the new textbooks as "gorgeous," Rosner argued that "no printed book can compete with this." 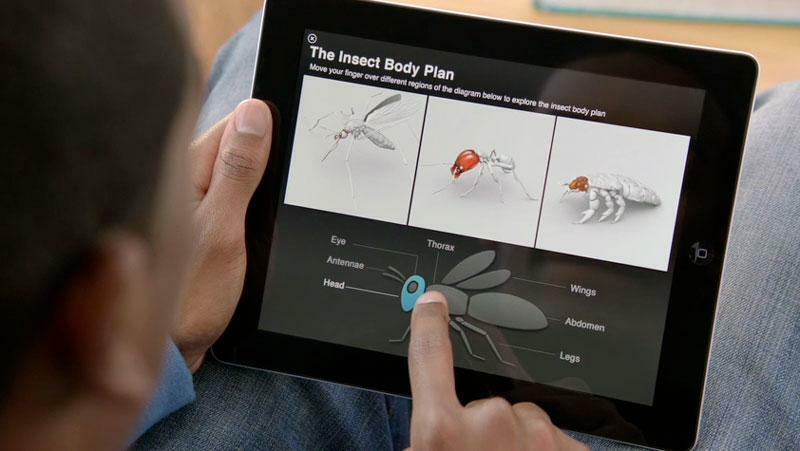 He demonstrated the ability to pinch into photos, and showcased 3D models of biological structures that can be rotated and manipulated in real-time —all of this interaction happens within a digital textbook in iBooks 2. Titles were shown off in both portrait and landscape mode. When switching to portrait, the digital textbook takes on a simpler look, with smaller pictures on the side and reading the more dominant task. Rosner's demonstration utilized a number of multi-touch gestures to interact with the book, like pinch the page to access the table of contents. He also used features like tapping a word to get a definition, or to access a glossary. Also demonstrated was a new gallery view. Users can swipe to browse the images in a gallery, and tap the screen to make the image go fullscreen. iBooks 2 also offers chapter summaries, and multiple choice tests with questions and answers. Students are offered immediate feedback on their answers, and teachers are given options for layouts and question types. Additionally, the new platform simplifies note taking, allowing students to swipe over text to highlight. Tapping highlighted text allows students to change the color, while notes can be added to the margin by tapping the note icon. 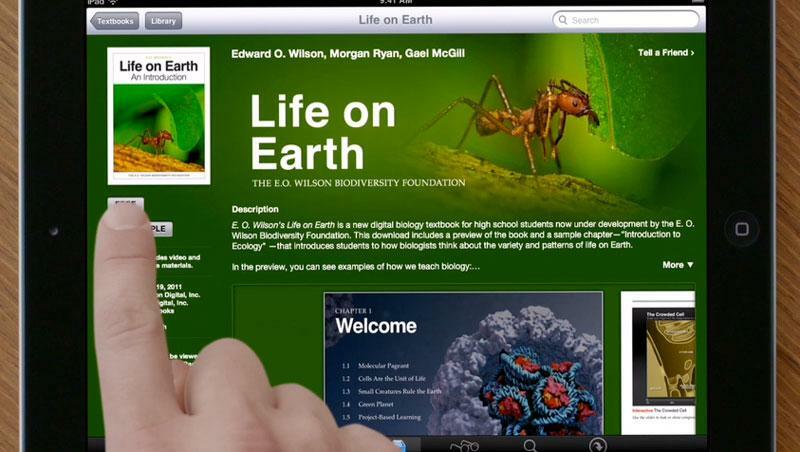 New textbooks can be purchased from the iBookstore, where screenshots of titles are also available. Free samples remain available, and there's an option for one-tap purchasing. Titles can be re-downloaded as needed. 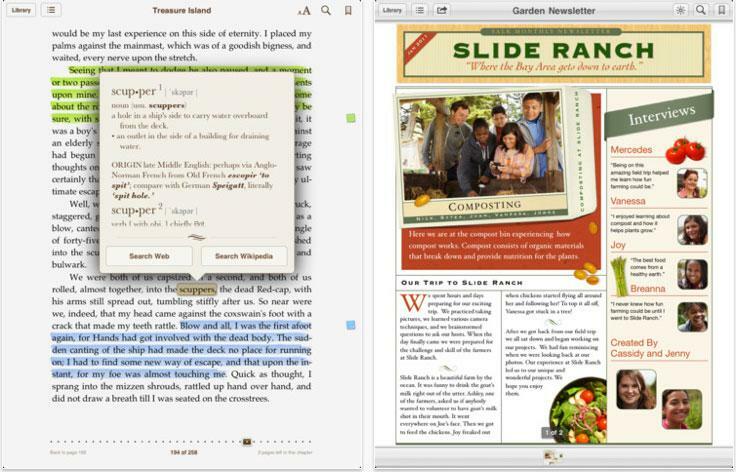 iBooks 2 remains a free application, and the new update is available on the App Store today. Apples's added push into the education, with a specific focus on student engagement, comes at a time when US scholars are lagging far behind their international peers. US students rank 17th in reading, 21st in math and 23rd in science, Schiller said. And those students who are lucky enough to work hard and graduate may still not be best positioned to compete in the global market, he added. For their part, teachers interviewed ahead of Thursdays event said they've long battled low levels of engagement and witnessing students struggle with basic reading and writing skills while generally lacking interested in subjects taught in the classroom. Meanwhile, class sizes have swelled to excess of 40 students each inside institutions whose infrastructure is falling into disrepair and which lack all the modern technology —and even all of the text books —they need. While Apple acknowledge that "no one person or company can try to fix" all of the education shortcomings plaguing the US, the company feels best positioned to help. Already, 1.5 million iPads are in use as part of US educational programs and the App Store already boasts more than 20,000 education and learning applications for the iPad —a number which is sure to swell given the Cupertino-based company's latest initiative.